Ryan's is your one stop shop for insulation, injection foam, soundproofing, ice dam removal/prevention, blown-in insulation and more. Hire the right insulation contractor in St. Charles Minnesota. Ryan Insulation is an experienced contractor offering the best in insulation and insulation services like soundproofing, energy audits and ice dam removal. Ryan's is the best source for attic insulation in St. Charles. We also offer injection foam and other forms of insulation for different project types. Our robust list of insulation services is unmatched and second to none. If your worried about your homes energy efficiency level, and feel your energy bills can be reduced give us a call. Our full-time insulation team will work quickly to layout the different areas in your home that can be improved with upgraded insulation. Today's insulation products are better thanever. We utilize CertainTeed's InsulSafe SP attic insulation which we find outperforms other top brands out there. Giving our customers the very best is all we do. A customer first attitude is what makes our company so successful. This success is passed on to our customers through added savings and dependable service for the whole duration of your project. Don't settle for just any contractor, trust your home to Ryan's - St. Charles leading insulation experts. Some homes in St. Charles experience ice dams. Ice dams can often be reduced or eliminated by increasing or upgrading your attics insulation. During the winter Ryan's offers a fast ice dam removal / prevention service. 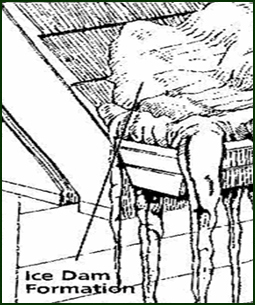 If your St. Charles home is subject to ice dam formations give us a call.